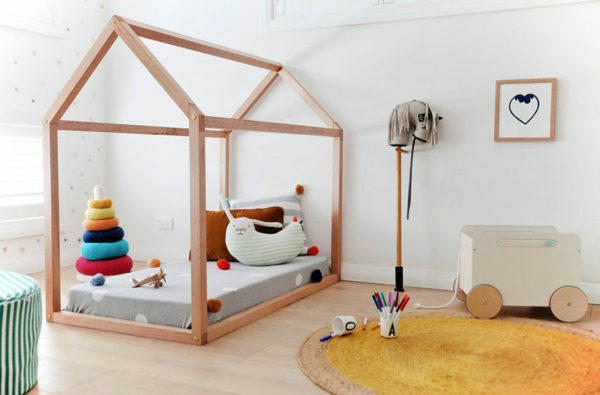 7 first big beds your little one will love! Making the transition from cot to bed can be tricky. Here’s seven brilliantly fun beds which (we hope) will have the kids wanting to be tucked in once and once only! The Voyager Bed is the sort of bed big dreams are made of. Full of maritime fun, this single bed and handy concealed trundle will with any luck, see littlies keeping their bedroom ship shape. The Voyager bed and trundle is priced $2599, available from Pottery Barn Kids. Kids will be racing off to bed to snooze in the Speedy Kids Bed. 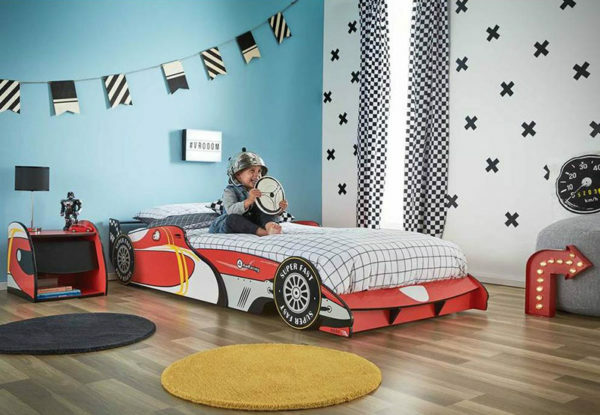 In true race car style, this bed is low set, perfect for kids transitioning from cot to bed. Priced $249, you’ll find it parked at Fantastic Furniture. Save on space by investing in the Busunge Bed, which grows with your child. Start out short and cosy, before extending to full size. Priced from $249, it’s available from Ikea. For little one’s whose transition from cot to big bed comes with sharing a room with a sibling, the My Place Bunk is a fun option. Standing at a squat 120cm tall, naturally the older sibling takes top position and the sweet nook underneath goes to the first timer. Fun! Priced $1099 from Domayne. The Addison bed, priced from $699.95, in all of its pitched roof glory, makes for a brilliant sleeping space. Available with legs or without, it potentially moonlights as a fort, doubling the bedtime fun. For a bed a little more streamlined, be sure to check out the Oliver bed, $599.95. Both beds can be ordered direct from This Little Love. Add a pop of gorgeous colour to your little one’s bedroom with the dreamy Popsicle Bed (pictured top). Ageless in design, the metal tube frame will survive all the knocks (and toys) kids can throw at it. Find the Popsicle Bed at Forty Winks, priced $399.